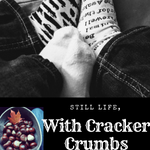 April Book Club | Still Life, With Cracker Crumbs..
Chrissy was our hostess this month, and the book we read was The Hideaway by Lauren K. Denton – and I loved it. It was a full house this time, with all of us able to go. We all loaded up our plates with pizza and cheese and bread, filled up our wine glasses, and took our places in the living room, where we admired Chrissy’s new couch. It has a “cuddler” feature, which juts out just a bit more, making it so you can curl up with a book or a toddler or cuddle with your sweetie while watching a movie. It was very comfy! But made us all super anxious – we were all paranoid of being clumsy and spilling our pizza or wine on it! I don’t think Kelly set her drink down all night! Whenever we get together there is the normal chatter, catching up on this and that and the other. We talked about our kids – over the years we have all become moms! We talked about Jill’s upcoming wedding, Chrissy’s plans for their house, Alyssa’s job; about our families, our pets. What we have been up to since last month. It was a gorgeous night out, spring might be finally here (fingers crossed, it’s been such a long winter! ), so we had the setting sun behind us as we drank and ate and talked and laughed. We finally arrived at the book. I loved this book, I read it so fast. It was one I read whenever I could get a chance, waiting to pick up my son, before bed, sometimes while brushing my teeth. I have to say, it was a little sad. The story begins with workaholic Sara Jenkins learning that her grandmother has died – a grandmother that she never really made much time to go and visit, a grandmother who raised her when her parents died, a grandmother who was her only family member. Sara reluctantly heads back to her small hometown, away from her life in New Orleans, which really isn’t much of a life, as she lives for work and not much else, for the reading of the will and to tie up loose ends. Instead, she gets much, much more. She learns so much about her grandmother, a woman who embarrassed Sara when Sara was a teenager because of her eclectic ways. Sara though, begins to know the woman her grandmother really was, and the story of their home, an old B&B that was no longer much of a B&B, aptly named The Hideaway. Sadly, Sara missed out on knowing her grandmother when she was alive, which made me a bit teary. Pay attention to your family while they are here, darn it! Don’t take loved ones for granted. Talk to them, learn their best stories. The Hideaway itself was in actuality, a bit of a real hideway for Mags. And it made me think, what my hideaway would be like – not to go forever, but maybe a weekend. Or a place to go with my family, away from everything for a bit. I am a mountains girl – I am all about the foggy mornings and evenings in the mountains, looking out at a forest of old trees, the light streaming through the leaves. So for me, a perfect hideaway would be in the woods of the mountains somewhere, a cabin all cozy and snug. Chrissy is a beach girl through and through, so is Jill. Take those ladies to a beach house, a sandy spot with the sun warming them, and the salt heavy in the air, the sound of waves crashing, the water whispering at night. Then excitement! My husband called me to ask if I had heard and felt the rumbling – we hadn’t, I guess we were all enjoying our dessert of Turtle Pie too much. There had been an earthquake here in our area – very rare for Michigan! And it was a 3.6! I guess most of our area felt it, pictures shook, it was very loud and rumbly just a few miles further south. Book Club is a powerful force! Then, all the excitement over, the wine drunk, the chocolate consumed, the chatting slowing down, the insanity of an earthquake, we headed on home to our families until next month. So, how about you? How do you picture your hideaway? Oh wow, an earthquake? I didn’t know Michigan could get them. We have a fault that runs perpendicular from our court. I guess my hideaway would be filled with comfy furniture, bookshelves of books, and bookshelves of yarn along with a sewing table. How cool you do book club w/friends. I’m lucky to see my high school peeps once a year. I didn’t go to book club this month and will probably skip next month b/c the book they’re reading has long hold lists for all versions. I suppose I could look at the used bookstore. We’ll see. They are pretty rare here – I think in my life I remember experiencing three total maybe? It was so crazy, Facebook was all what was that? Was that an earthquake? Although to be fair, the last time the ground shook in Michigan (this winter), it was a meteor that had entered the atmosphere in the Detroit area! That was crazy too! That sounds like a cozy hideaway!! It’s hard when the book is impossible to get. We had one like that recently too. I was bummed out that I didn’t get to read the actual book.